Who needs astronomers? Every 53 days, something incredible happens at Jupiter that relies purely on citizen scientists. Our species' most distant solar-powered space probe is at the giant planet to learn about its atmosphere, its magnetosphere, and its mysterious interior below the cloud. It's pretty complex stuff, and none of it requires photographs. However, in a happy accident, Juno is quickly becoming all about gorgeous photography thanks to a tiny onboard camera and a vibrant online collaboration community. "The science objectives for the Juno Mission don't actually require a visible camera," says senior scientist Dr. Candice Hansen, who is responsible for the development and operation of JunoCam, which is best described as an 'outreach camera'. "The purpose of JunoCam was for public engagement, so as long as we can pump out beautiful pictures, we are fulfilling our mandate." 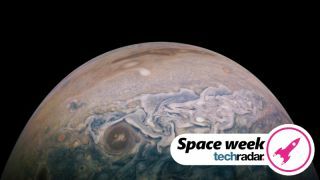 That is a massive understatement, and it’s all down to a bunch of volunteer ‘citizen scientists’ back on Earth who download JunoCam’s images, process them, then upload them. “Björn Jónsson is one of our most active contributors and he prides himself on getting the colour of Jupiter just right," says Hansen about the photographer of this image. “If you were riding on Juno taking pictures with your cell phone, this is what Jupiter would look like." However, Jónsson – a software engineer from Iceland – often can't help himself, regularly also posting less realistic, but perhaps more pleasing-to-the-eye versions of his creations, usually by exaggerating colour and upping contrast. He's also recently produced a wonderful global map of Jupiter. One of the most prolific and unique contributors is Gerald Eichstädt, a mathematician from Germany. "Gerald figured out experimentally how to take out the lighting difference when you're going from the terminator – where the shadow between day and night is on Jupiter – all the way over to the sunlit side of the planet," says Hansen. "There's a huge difference in brightness and he figured out how to flatten that out, so a lot of people start with his products rather than ours." Eichstädt has gone on to do mathematical representations of the clouds and the storms on Jupiter, as well as this incredible time-lapse video of one of Juno's flybys. Another one of JunoCam's biggest success stories is Kevin Gill, a software engineer at NASA’s Jet Propulsion Laboratory in Los Angeles whose incredible images (like the one above) regularly grace social media, newspapers and magazines after a close fly of Jupiter by Juno. "I've watched Kevin’s stuff mature over the years," says Hansen. "Every time he posts it's better than the last […] you could frame this one and put it on your wall." Another of JunoCam's biggest users is Seán Doran, a visual artist with a special interest in science and astronomy, as well as being a citizen scientist. His most famous image is the 'dolphin': a capture of changing cloud formations across Jupiter's southern hemisphere where a cloud in the shape of a dolphin appears to be swimming through the cloud bands (here’s a close-up). Doran also uploads some incredible smartphone wallpaper-sized images. It's not all science. Unexpectedly, there have been a handful of conceptual artists who have gotten real inspiration from JunoCam’s raw images and produced some unreal creations. What kind of camera is Junocam? JunoCam, a small and not particularly advanced camera, takes scatter-gun photos as it gets close to the planet, which is sent back to Earth and immediately put online. "It's a push-frame camera, so we get strips of blue-green-red raw data as the spacecraft is rotating, then we make them into monochrome images, and then we stack and map-project them to make the colour," says Hansen, who helped discover supersonic jets of water spewing from Saturn's moon Enceladus during NASA’s Cassini mission. "It's lightly processed by a tiny professional team, who then post it all online.” Absolutely anyone can download the raw images and get processing, then upload their work later. “We just sit back and these incredible pictures come to us – it's worked out spectacularly well," says Hansen. JunoCam has a 58-degree field of view and the detector has 1600x1200 pixels, so that's about two megapixels. However, each image is an amalgamation of images that JuncoCam takes as the spacecraft spins. The closest Juno gets to Jupiter is during a flyby – called a perijove – when it's about 3km/pixel. It's really that distance that determines the sharpness, and during Juno’s brief polar flyby every 53 days, it changes very quickly. So are these guys replacing NASA scientists? "Yes and no – we are not writing science papers at any kind of a fast clip because we don't have a team of scientists analyzing these images," says Hansen. There has been a paper published analyzing JunoCam's early images, and another on Jupiter's cyclones, but aside from that JunoCam's images haven't been studied closely. "The public has been amazing, but they don't replace a real science team, and that's a shame because we would have a lot more material coming out if we did," says Hansen. “When we got the first photos back from JunoCam we realised it was an amazing instrument, and wished we had a science team." However, it's not too late; Juno is expected to be in the Jovian system for at least another three years.